When the farmer arrived at the obedience school to pick up his newly trained bird dog, he asked the instructor for a demonstration. The two men and the dog went to a nearby field where the dog immediately pointed to a clump of brush, then rolled over twice. “There are two birds in there,” the instructor said, and sure enough, two birds were flushed. A minute later, the dog pointed to another bunch of bushes, then rolled over five times. “There are five birds in there,” the instructor noted, and indeed five birds were driven from the brush. Then the dog pointed to a third clump. 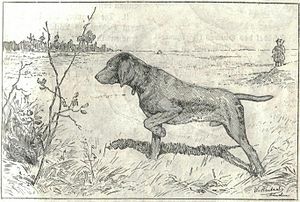 The dog began to whine and run in circles until he found a stick, which he shook mightily and dropped at the two men’s feet.